There are different types of polyamides that vary in their chemical constitution and are derived from different raw materials. The most important polyamides are the product types polyamide 6 (PA6) and polyamide 66 (PA66). All details of the present study relate to the two products. In 2014, a worldwide turnover of around 24.4 billion US$ was achieved with PA6 and PA66. The market research institute Ceresana expects annual revenues to increase by 3.1% p.a. to approximately 31.2 billion US$ until 2022. This market report covers all relevant data and facts regarding the polyamide market, trends, market size and market growth. The most important sales market for PA6 and PA66 is the production of fibers and filaments. Polyamide fibers are synthetic fibers and are considered to be especially tearing and abrasion resistant and have a high elasticity and shape stability. Polyamide 6 and polyamide 66 are used for the production of textiles and industrial filaments as well as for carpet and staple fibers. About 43% of global demand for PA6 and PA66 are used as engineering plastic in a large number of different applications. Polyamide is mainly used in the transportion area, for example for brake hoses, plug connectors, battery cases, oil sumps, switches and handles. The highest growth rate between 2014 and 2022 we forecast for the second largest application area electrical applications and electronics that is likely to see market volume increase by 4.3% p.a. during the next eight years. At a global level, polyamide 6 accounted for the largest part of total demand for polyamide. This market is dominated by the Asia-Pacific region that reached a global demand of approx. 68% in 2014. Here, mainly the high demand for PA6 in the segment textile filaments plays an important role: In Asia, around 1.5 million tonnes account for this application. While global demand for PA6 is mainly determined by the segments textile and industrial filaments, technical applicants account for almost 56% of demand for polyamid 66 - in Western Europe even 71%. Chapter 1 provides a presentation and analysis of the global market for polyamide (PA6 and PA66), including forecasts up to 2022: revenues development as well as production and demand volumes are analyzed. Chapter 2 offers a detailed analysis of the polyamide market in the 19 major countries. Data on demand, revenues, production, producers of polyamide and their capacities as well as import and export is provided. Demand for polyamide split by applications is examined in more detail for the individual countries. Furthermore, the aggregated demand for polyamide is split by technical and fiber quality as well as by the individual product types PA6 and PA66. 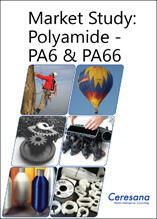 Chapter 3 offers a detailed analysis of the applications for polyamide (PA6 and PA66). The segments transportation, electrical applications and electronics, consumer goods, packaging and films, other technical applications, textile filaments, industrial filaments as well as other fiber applications are examined. In Chapter 4, the product types polyamide 6 and polyamide 66 are examined individually. Development of demand as well as the application areas for the world and the regions Western Europe, Eastern Europe, North America, South America and Asia-Pacific are examined.